It is with GREAT excitement that I am announcing this! 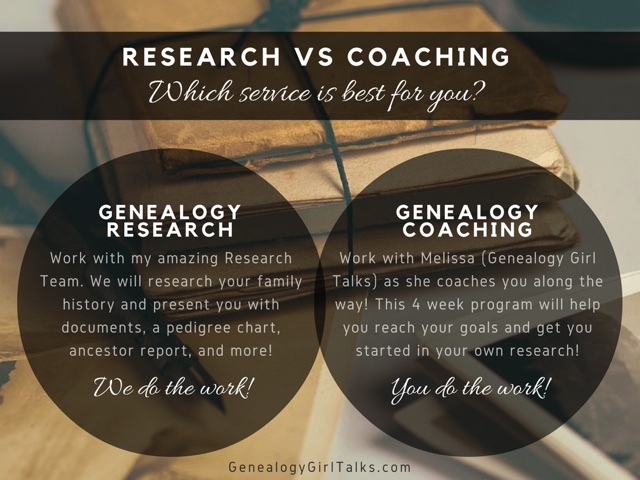 A lot of work and planning has gone into creating these two services now offered by Genealogy Girl Talks! Back in 2014 I created Genealogy Girl Talks. My intention was to offer tips, tricks, and advice to help others on their Genealogy and Family History journey. I created books, graphics, videos, a podcast, and blog posts to help others. I will continue offering these, but now I feel a deeper purpose. I want to help you discover your Family History in a different way. I want to help you with your research. 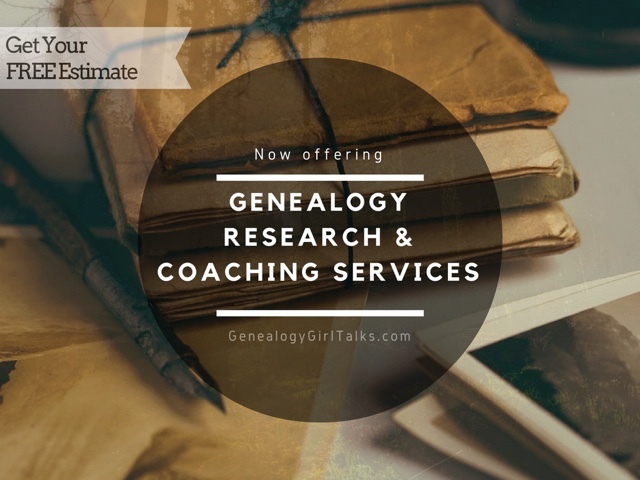 I am now offering two different services - Genealogy Research and Coaching Services. What is the difference between these services? I put together an amazing Research Team who will do the work for you! We will work together to research your family history and present you with our findings. What do these findings include? We will present you with digital copies of documents and records we find along the way, active links to sources, a pedigree chart, an ancestor report, a gedcom file so you can upload your tree, a brief research report, and more! Each of the items you receive as a result of our research will be digital files you can save and print from home. The Genealogy Coaching program I offer is a 4 week program consisting of one hour sessions. Together we review your goals and I work with you to help you reach them! I will coach you along the way as you do the work! Each session will offer you tips and advice on your next steps. Whether you are just starting out on your family history journey or you just need a little help, I can help you. We can work together to reach your goals. To learn more about these services, follow the links below. If you are interested in a FREE Estimate, click here to complete the form. I will review your goals, make sure we can help you, and present to you an estimate of the costs.